Bellevue Literary Press, 9781934137963, 192pp. In an essay entitled "Spirit and Vision" Melissa Pritchard poses the question: "Why write?" Her answer reverberates throughout A Solemn Pleasure, presenting an undeniable case for both the power of language and the nurturing constancy of the writing life. Whether describing the deeply interior imaginative life required to write fiction, searching for the lost legacy of American literature as embodied by Walt Whitman, being embedded with a young female GI in Afghanistan, traveling with Ethiopian tribes, or revealing the heartrending story of her informally adopted son William, a former Sudanese child slave, this is nonfiction vividly engaged with the world. In these fifteen essays, Pritchard shares her passion for writing and storytelling that educates, honors, and inspires. Melissa Pritchard is the author of, most recently, the novel Palmerino and the short story collection The Odditorium. Her books have received the Flannery O'Connor, Janet Heidinger Kafka, and Carl Sandburg awards and two of her short fiction collections were New York Times Notable Book and Editors' Choice selections. Pritchard has worked as a journalist in Afghanistan, India, and Ethiopia, and her nonfiction has appeared in various publications, including O, The Oprah Magazine, Arrive, Chicago Tribune, and Wilson Quarterly. She lives in Phoenix, Arizona. 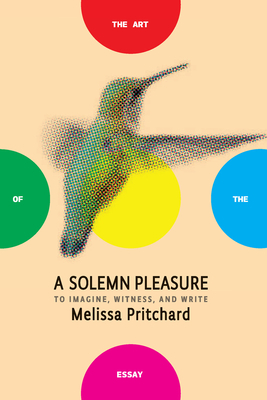 Melissa Pritchard is the author of eight books of fiction, including the novel Palmerino and the story collection The Odditorium, as well as the essay collection A Solemn Pleasure (forthcoming from Bellevue Literary Press in 2015). Among other honors, her books have received the Flannery O'Connor, Janet Heidinger Kafka, and Carl Sandburg awards and two of her short fiction collections were New York Times Notable Book and Editors' Choice selections. Pritchard has worked as a journalist in Afghanistan, India, and Ethiopia, and her nonfiction has appeared in various publications, including O, The Oprah Magazine, Arrive, Chicago Tribune, and Wilson Quarterly. She lives in Phoenix, Arizona. Foreword contributor Bret Anthony Johnston is the author of the best-selling novel Remember Me Like This, a Barnes & Noble Discover selection and New York Times Editors' Choice, and Corpus Christi: Stories. He's also the editor of Naming the World: And Other Exercises for the Creative Writer. He is the Paul and Catherine Buttenweiser Director of Creative Writing at Harvard University.